The tweak works really well. When using it, it open links from mail, messages, and app in your default browser. It’s pretty easy to set your default browser after you download it. 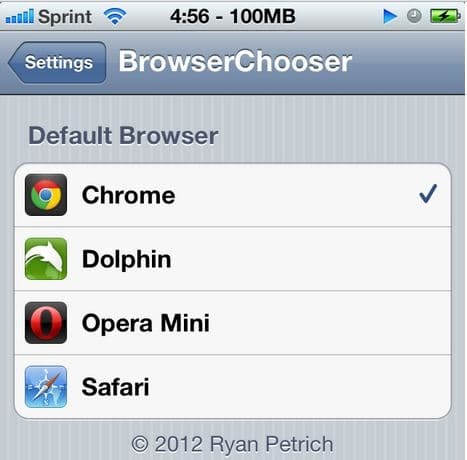 All you have to do is navigate to Settings > BrowserChooser and select the default browser your want to use. 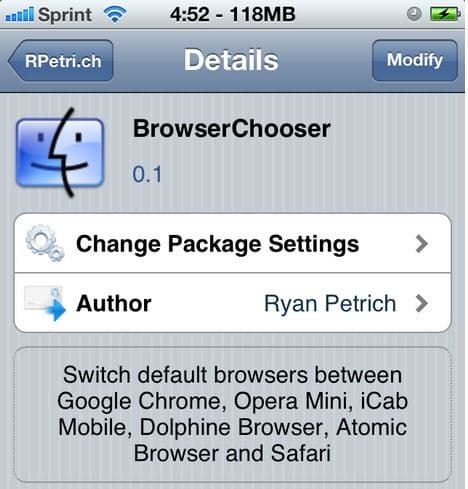 BrowserChooser can be downloaded on jailbroken iPhone, iPad, iPod touch from Cydia. If your device is jailbroken, open up Cydia, click Manage > Sources > Edit > Add and add http://rpetri.ch/repo as your source. Search for BrowserChooser, and install it.